The first Conference of the FIP will take place in Valencia in September 2011 from 13th to 17th. The main topic of the Conference is the Global Strategy for Plant Conservation, which represents the international framework for the National Biodiversity Strategies and has strong relationships with the Habitats Directive, Planta Europa and other international Conventions. Plant sociology can significantly contribute to achieve the different targets of this Strategy, for its crucial and vital role in the ecological context and as fundamental basis for knowing and conserving biodiversity and evaluating ecosystem services. I wish to thank Manuel Costa and Pilar Soriano, the Scientific and Organising Committees and the coordinators of symposia for the time devoted to this important event. I invite the Presidents of the National Societies and all members to attend and advertise the Conference by involving people dealing with plant ecology, nature conservation, landscape ecology, and environmental planning. Plants and vegetation are universally recognized as a fundamental part of the world’s biological diversity and an essential resource for the planet. To Improve long-term conservation, management and restoration of plant diversity, plant communities, and the associated habitats and ecosystems, is an important task within the United Nations strategy for the year 2010, proclaimed International Year of Biodiversity and during which, according to the objectives of the Global Strategy for Plant Conservation, is a goal to protect 50 % of the most important areas for plant diversity. This is a strategy that cannot end in 2010 but should continue as a necessity and a challenge for the future. Following this objectives The International Congress "Global Strategy for Plant Conservation" will be held in Valencia in September 2011. The aim of this conference is to highlight the role that plants and vegetation, as a fundamental part of the natural ecosystem function, have in the conservation of biodiversity. The objective is to gather information concerning the current situation of the landscape, its conservation and recovery, to provide new ideas and perspectives on knowledge of ecosystem functioning and the benefits that the correct management of natural resources can contribute to society. The congress will cover four subjects in three different symposia and a workshop. Every symposium will consist of a number of scientific presentations (orally and posters). 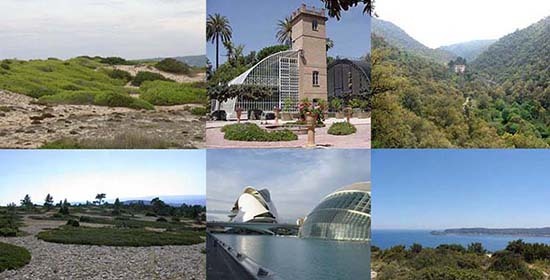 Two daily excursions are scheduled, one mid-conference excursion in the coastal area around Valencia Community (dunes, saltmarshes and cliffs) and a post-congress excursion, with a limited number of participants, visiting the inner mountainous area.